The goal of learning Russian is to make you be able to use the new language both fluently and accurately. Thus your teachers use the communicative approach as the most effective method during the lessons. The teacher takes the role of coordinator in meaningful communication such as role-plays, information sharing and problem-solving. By the help of audio-lingual and direct method, you develop all four language skills. Also your teachers do not use any translation. So the Russian language surrounds you completely, thus allowing you to progress more successfully. When you just start to learn Russian – you build your basic grammar skills and increase the vocabulary. For example, by taking part in short dialogues, pair and small group work. Later the teacher creates classroom activities. There you can talk about daily life, share your opinion about various subjects and learn how to avoid communication breakdowns. During your Russian language learning process, the attention is on the development of independent learning across all levels. This includes work on study skills, good study habits and self-assessment. There is a good balance between fluency and accuracy when the teacher pays attention to your grammar and pronunciation. At the end of your studies, you receive a Certificate. There, all 4 language skills – reading, listening, writing and speaking are evaluated indicating the achieved level. 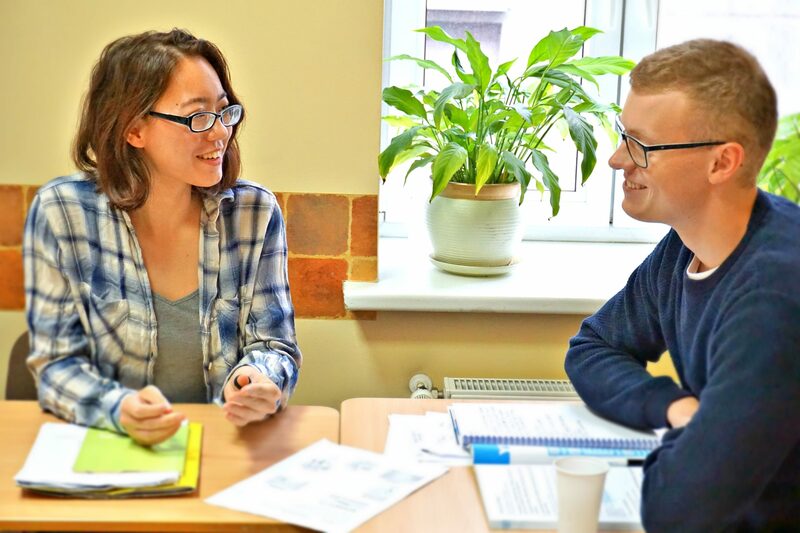 The biggest benefit in learning Russian with the communicative approach is that it works effectively with both types of students. For example, with those who are shy and quiet, and those who are more active during the class. How would you describe yourself? No matter what’s the answer, you will always receive positive support from the teacher. The teacher will encourage you and involve you in different classroom activities. Your self-confidence will grow, you will use the Russian language more actively. If you feel comfortable using Russian – be a positive partner for your group mates in various dialogues and group discussions. The teacher will analyse your vocabulary and will correct your grammar mistakes if necessary. One of the great values of RLA Durbe are professional and charismatic teachers with significant experience! Your teacher will be an experienced native Russian-speaker who specialises in teaching Russian as a foreign language. Each teacher earned an academic degree in education, philology, applied linguistics or pedagogy. All teachers regularly attend professional development courses and training to continue professional growth and maintain high teaching standards. The teachers are really interested in your progress! So you will get individual attention during the class as well as the individual feedback from them after weekly tests. They will encourage you and will help to choose any book from the school’s library to practice reading skills. Feel free to ask the advice on some useful websites to master your Russian language! The online placement test on Russian Language Academy Durbe’s website + speaking test (except complete beginners) helps to place you in a group according to your level. During the interview in the Office or on the phone, you express your wishes, necessities or demands of the course. If you have very special needs you’re advised to book the individual lessons and your teachers will design a special syllabus based on your level of knowledge. Regular progress tests are held to monitor your progress and success. 1 А1 level You start this course without any pre-knowledge of the language. You will learn how to read, write and say the new words with correct intonation and pronunciation. You will learn to use basic greetings and leave taking expressions, ask and answer simple personal questions, will learn to ask and answer easy questions about yourself, where you live, people you know and things they have. 2 A1+ level You have got your first knowledge and can continue with learning how to make simple transactions in shops, post offices or banks, get simple information about travel, use of public transport, ask for basic information, ask and give directions, buy tickets, ask for and provide everyday goods and services using the basic structures of the grammar. 3 A2 level You will learn how to describe oneself, family, friends, where one lives, his/her hobbies and interests, educational background, past experiences and events. You will read simple personal messages and letters about everyday life, simple instructions for using equipment, short narratives about familiar topics. More grammar structures will be introduced such as comparative and superlative degrees of adjectives and adverbs, ordinal numbers. 4 A2+ level This course will continue studying the basic skills of the language and you will expand the vocabulary on topics about shopping, celebration of special family events, discussing prices, making comparisons, expressing doubts, concerns, reassurance, permission, enthusiasm or regret, correcting a wrong assumption, asking and telling time. More complicated grammar and richer vocabulary will be used to describe past activities and personal experiences, habits and routines, describe plans and arrangements. 9 B2 level During the course there will be a lot of reading tasks such as short stories, book chapters, and poetry or newspaper articles as well as themes for discussion on society, economics, art, literature, music, cinema etc. The reading exercises will be complemented with writing exercises (summaries, opinions, comments etc) and supplemented by listening tasks to master all 4 language skills. 10 B2+ level The course is a continuation of the B2 level course. The topics of the course give students the ability to repeat, rejuvenate and reactivate topics studied before, and to review any difficulties they faced. Studnets will learn how to express detailed factual information, degrees of emotion, opinions, defending points of view in discussions and reacting to others: give detailed descriptions on a wide range of topics, sustain a reasoned argument: express a viewpoint, talk about consequences, advantages and disadvantages, write clear and detailed texts, summaries of articles, short book or film reviews, and write personal letters explaining complex ideas and feelings.